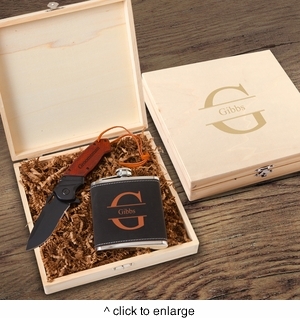 An exceptional groomsman gift set or best man’s gift set, this alluring collection has a mix of standard engraving and personalization that will surely please him from day one. Details: 6 oz. Flask wrapped color is black suede; personalization color is orange Wood-handled knife features blackened drop-point stainless steel blade Personalized wooden box measures 8 3/8" x 8 1/8" x 1 7/8"
Personalization: Personalize flask and box with matching design choice of Antler, Circle, Modern, Stamped, 2 lines or 3 initials.